This is a CHARMING two bedroom, two bath stucco COURTYARD VILLA in the Village of PINE RIDGE! This villa is offered BEAUTIFULLY FURNISHED/TURNKEY and is move-in ready! The home features an open-concept floor plan with neutral carpet through the living areas and the bedrooms! VOLUME CEILINGS in the home create a spacious feel! The kitchen is equipped with rich HICKORY cabinets, upgraded cabinet hardware, smooth-top range, space-saver microwave, side-by-side refrigerator, closet pantry and a large breakfast bar! The home is light and bright with sliding doors to the outside in both the living room and dining room. The master bedroom features sliding doors access to the lanai. The master suite offers a trey ceiling, large walk-in closet and access to the master bath which has a shower and single-sink vanity. The guest area has a comfortably-sized bedroom and a convenient guest bath with a tub/shower combination. 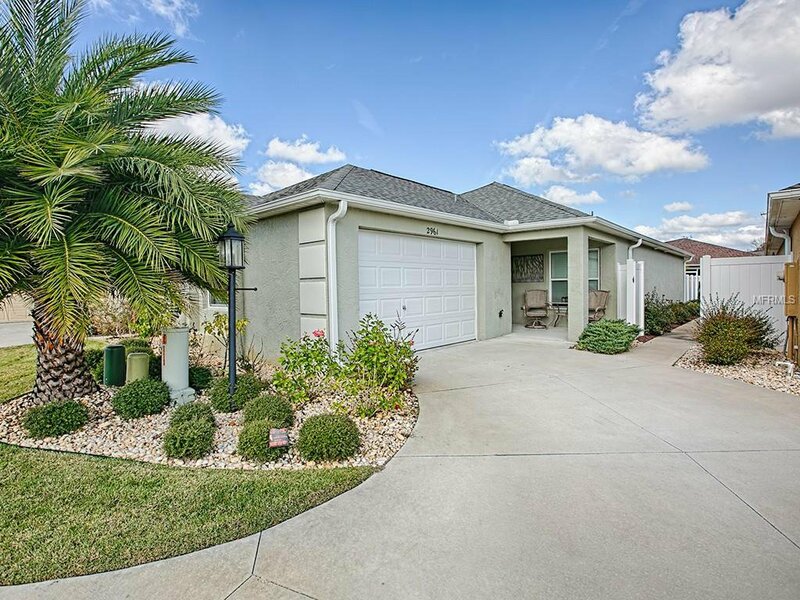 The home offers a south-facing screened lanai and a side patio to enjoy the Florida sun! The home is surrounded with stone-covered planting beds filled with lush Florida landscaping. This is a lovely home, stylishly furnished and decorated, with everything needed to start enjoying all the shopping, dining and fun in The Villages!! Listing courtesy of REALTY EXECUTIVES IN THE VILLA. Selling Office: FOXFIRE REALTY.